Add the chorizo sausage and two tablespoons of olive oil to a 3 inch deep, 14 inch pan. Put the pan on low heat. Cook the chorizo sausage until it is crispy on all sides. Remove the chorizo sausage to a plate lined with a paper towel to drain. Add the shallot, the garlic, the oregano, the sea salt, and the crushed red pepper flakes to the chorizo flavored olive oil. Cook for two minutes. Add the white wine. Scrape the bottom of the pan to remove any of the brown bits that have accumulated. Add the clams and the clam juice. Stir well. Simmer on low heat stirring occasionally. In the meantime, cook the spaghetti in a pot of salted, boiling water according to the package instructions. Reserve 1/2 cup of the pasta cooking water. Drain the pasta well in a colander. 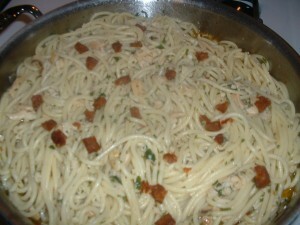 Add the spaghetti, the reserved pasta cooking water, the lemon juice, the parsley, and two tablespoons of olive oil to the clam sauce. Cook while stirring for three minutes. Turn off the heat and serve. Garnish the spaghetti with the crispy chorizo sausage bits. Lay the pork loin on a cutting board with the fat cap facing up. At the mid point of the side of the loin facing you, cut about 3/4 of the way through the pork with a sharp chef’s knife. Be careful not to cut all the way through the meat. Open the pork loin up like a book. Sprinkle the meat with sea salt and black pepper. Scatter the garlic slices and the chopped parsley, thyme, and oregano evenly on the pork. Place the pork tenderloin right in the center of the pork loin. 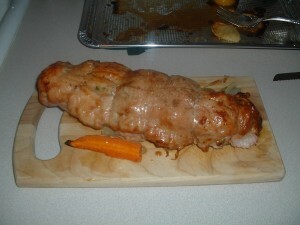 Fold the sides of the pork loin over the pork tenderloin. Tie the meat tightly in several places with the butcher’s twine. Tying the roast helps to cook the meat evenly. Rub the outside of the pork loin with the olive oil. Sprinkle the outside of the meat with sea salt and black pepper. Place the carrot, the celery, and the onion in the center of a roasting pan. Sprinkle the vegetables with sea salt and black pepper. Place the pork roast on top of the carrot, celery, and the onion with the fat cap facing up. Roast in the preheated oven for 90 minutes. Remove the butcher’s twine and let the meat rest for 15 minutes before carving. Into a 12 inch saute pan, add the butter and the olive oil. Cook on medium heat until the butter melts. Add the apple, the celery, the onion, and the garlic. Cook while stirring frequently for 5 minutes. Add the sage, the parsley, the thyme, the sea salt, and the ground black pepper. Turn the heat off and stir the mixture to incorporate all of the herbs and the spices. Into a mixing bowl, add the crumbled cornbread, the cubed Italian bread, the chicken stock, and the apple, celery, and onion mixture. Mix well. The stuffing should be a little on the wet side. Add more chicken stock if the mixture appears too dry. Whisk the buttermilk with the beaten egg and add it to the stuffing mixture. Mix well until the egg is incorporated. Apply cooking spray to a cake pan. 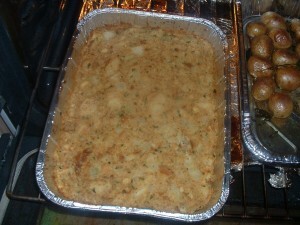 Place the stuffing mixture in the pan and spread it out evenly. Cover the pan with aluminum foil. Bake in the preheated oven for 45 minutes. Remove the aluminum foil during the last 10 minutes of cooking time. Preheat the oven to 350 degrees. Place a piece of the thinly sliced garlic under the skin of each piece of chicken. Brush both sides of the chicken pieces with two tablespoons of olive oil. Sprinkle both sides of the chicken pieces with a teaspoon of sea salt and 1/4 teaspoon of ground black pepper. Brush the chicken with the lemon juice. Sprinkle the tops of each piece of chicken (skin side up) evenly with two tablespoons of the chopped parsley. Roast the chicken in the preheated oven for 1 1/2 hours until the chicken is browned. Into an oven proof Dutch oven, add the chorizo sausage and a tablespoon of olive oil. Cook on low heat until the sausage becomes crispy. Add the onion, the red bell pepper, the jalapeno pepper, the minced garlic, the tomato, the turmeric, the oregano, the honey, the paprika, the crushed red pepper flakes, and two teaspoons of sea salt. Turn the heat up to medium high. Cook while stirring for 5 minutes. Add the rice. Stir well so that the rice grains get coated with the vegetable and the spice mixture. Add the chicken stock. Stir one more time. Bring the mixture to a boil. Spread the peas out evenly over the top of the rice. Cover the Dutch oven with a lid. Place the pot into a preheated oven set at 350 degrees for 45 minutes. Before serving, stir the rice well. Garnish the rice with a 1/4 cup of chopped parsley. 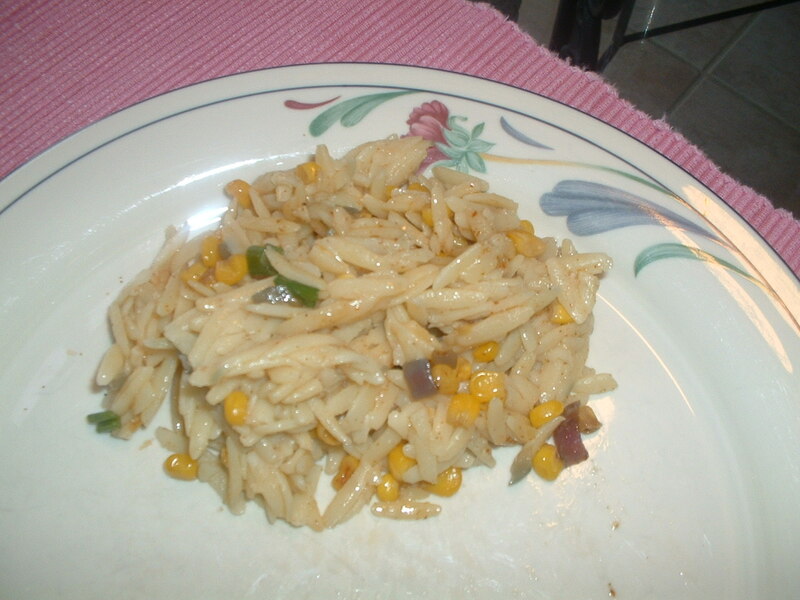 I arrange the chicken pieces on top of the rice and serve this dish family style. Serve with lemon wedges. 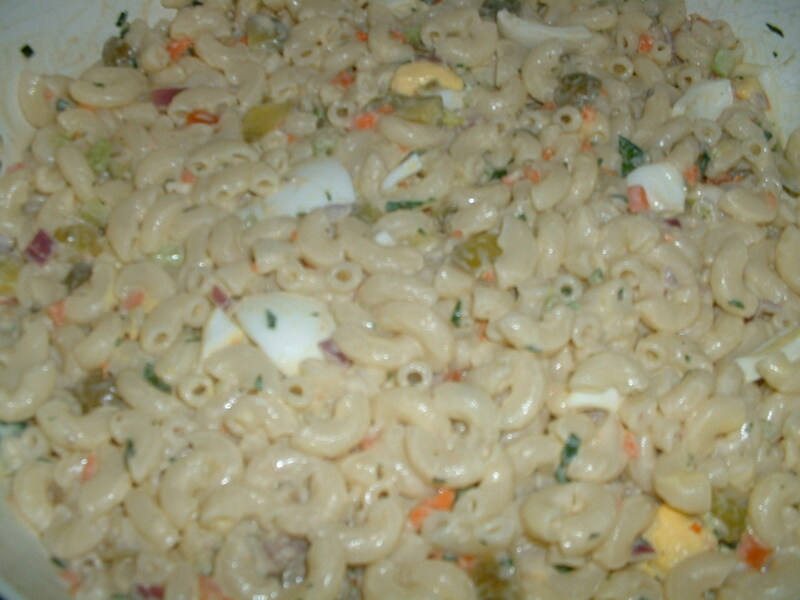 My twist on the traditional macaroni salad uses reduced fat mayonnaise, low fat yogurt, and buttermilk. Dill pickle juice and olive juice provide a tangy flavor. Into a large salad bowl, add the mayonnaise, the yogurt, the buttermilk, the dill pickle juice, the olive juice, the mustard, the minced garlic, the hot sauce, and the sea salt. Whisk until well blended. Taste and add more sea salt and/or hot sauce, if desired. Cook the elbow macaroni in a pot of salted, boiling water according to the package instructions. Drain the pasta well in a colander. While the pasta is still hot, add it to the salad bowl with the dressing. Add the red onion, the carrot, the celery, the pickles, the olives, the chopped hard cooked eggs, the capers, and the parsley. Mix the contents well. Taste and add more sea salt and/or hot sauce, if needed. This quick preparation makes for a fabulous side dish that goes great with burgers, chicken, or seafood. Cook the orzo in a pot of boiling, salted water according to the package instructions. Drain the orzo well in a colander. In the meantime, add the olive oil, the corn, the garlic, the red onion, the sea salt, the chipotle powder, and the cumin to a 12-14 inch non-stick skillet. Cook on medium heat while stirring for four minutes. Reduce the heat to low. Add the cooked pasta to the skillet. 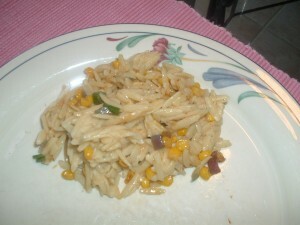 Cook for two minutes while stirring so that the orzo gets coated with the olive oil and the vegetables. Garnish with the chopped scallions and serve. Rub the pizza dough with a tablespoon of olive oil. Place the pizza dough in a bowl. Cover the dough with a damp towel or plastic wrap. Let the dough sit out at room temperature until it rises and just about doubles in size. Into a mixing bowl, combine the spinach, the ricotta cheese, the Romano cheese, the garlic, the basil, the parsley, the beaten egg, the sea salt, the nutmeg, the black pepper and the crushed red pepper flakes. Fold all of the ingredients together. Divide the pizza dough into four equal parts. Spread a thin layer of all purpose flour evenly on a flat surface. Using a rolling pin that has been lightly coated with flour, roll out each piece of dough into rough circles about 1/4 inch thick. Cook’s Note: Roll from the middle of the dough out towards the edges. This process will take a little time to do since the dough is very elastic. Place equal amounts of the ricotta cheese mixture into the center of each circle. Fold the dough over the cheese creating a half moon shape. Using a fork, gently press down the edges to create a seal. Brush each calzone with olive oil. Using a knife, cut three slits on the top of each calzone. Brush a baking sheet lightly with olive oil. 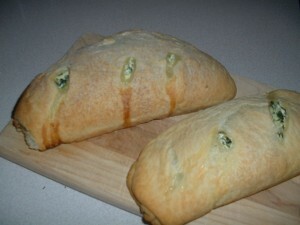 Place the filled calzones on the baking sheet leaving at least an inch of space in between each one. Bake in the preheated oven for 25-30 minutes until the calzones are golden brown. 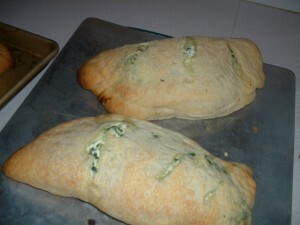 Let the calzones cool for 10 minutes before serving. Add two tablespoons of olive oil to a 12-14 inch non-stick skillet and put the pan on medium high heat for two minutes. Add the mushrooms and spread them out evenly in the skillet. Let the mushrooms cook without touching them for five minutes. Turn the mushrooms and cook for an additional three minutes. Turn off the heat. Add the sea salt, the black pepper, the garlic, the thyme, the oregano, and the parsley. Mix well. Brush the cut sides of the French bread uniformly with two tablespoons of olive oil. 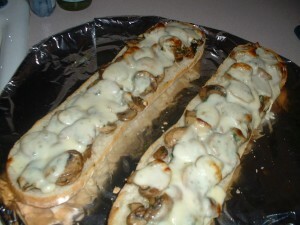 Spread the mushrooms out evenly on top of the cut sides of the bread. Sprinkle the mushrooms with the Romano cheese. Place the shredded mozzarella cheese on top of the mushrooms. Put the two halves of the French bread (cheese sides up) on a baking sheet. Bake in the preheated oven for 10-15 minutes until the cheese is bubbly. Let the pizza cool for 5 minutes. Cut into three inch pieces and serve. Add the olive oil to a Dutch oven. Put the pot on medium high heat for three minutes. Sprinkle the pork chops with a teaspoon of sea salt and 1/4 teaspoon of ground black pepper. Brown the pork chops in batches in the Dutch oven on both sides. Be careful not to crowd the pot. 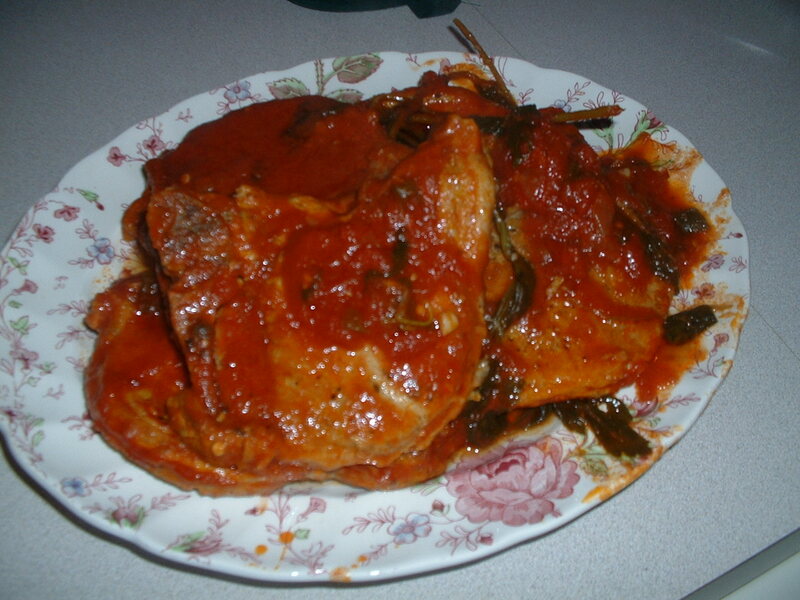 Once the pork chops are browned on both sides, remove them to a plate. Discard the fat that has accumulated in the pot but retain the brown bits that are on the bottom. Adjust the heat to medium. Add the onion, the jalapeno pepper, the garlic, two teaspoons of sea salt, and the crushed red pepper flakes. Cook while stirring for three minutes. Add the white wine. Scrape the bottom of the pot to loosen the brown bits that have accumulated. Cook the wine and the vegetables for four minutes. Add the tomato paste and stir the pot well so that the tomato paste is incorporated with the wine and the vegetables. Add the hand crushed tomatoes. Stir again. Add the basil, the oregano, and the parsley. Place the pork chops into the sauce. Cover and place the pot into the preheated oven. Cook for two hours. Remove the pork chops to a serving plate. Remove the oregano and the parsley stalks. Mix the sauce with a hearty cooked pasta such as rigatoni and serve the pasta with the pork chops. 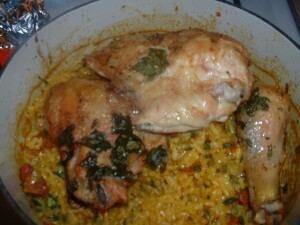 This is my spin on a classic Sicilian dish. Instead of frying the potatoes and eggplant, I brush them with olive oil and roast the vegetables in the oven. This method carmelizes all of the natural sugars and adds a depth of flavor. 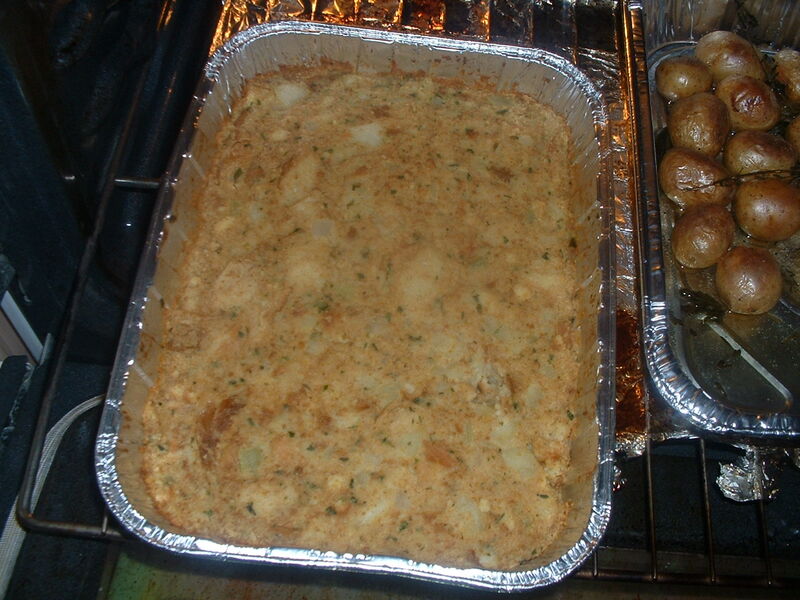 Place the cut potatoes and the cut eggplant on a sheet pan that has been lightly brushed with olive oil. Brush the vegetables with a 1/4 cup of olive oil. Sprinkle the potatoes and the eggplant with 1/2 teaspoon of sea salt and 1/4 teaspoon of ground black pepper. Roast the vegetables in the pre-heated oven for 40 minutes until they are lightly browned. Place the tomatoes, the basil leaves, the garlic, 1/4 cup of olive oil, 1/2 teaspoon of sea salt, 1/4 teaspoon of ground black pepper, and the grated Romano cheese into a food processor. Pulse until fairly smooth but not soupy. Taste and add more sea salt, ground black pepper, and/or grated cheese, if desired. Cook the pasta according to the package instructions in a pot of boiling, salted water. Drain the pasta well in a colander. Place the cooked pasta into a large mixing bowl. Add the tomato pesto. Mix well so that all of the pasta gets coated with the pesto sauce. 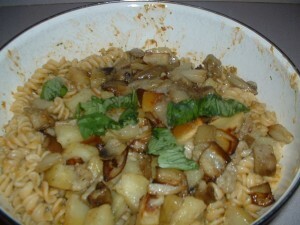 Add the roasted potatoes and the eggplant on top of the pasta. Serve with more grated Pecorino Romano cheese.